Brand B M Techno Machines Pvt. 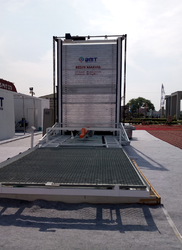 Ltd.
BMT is a pioneer in manufacturing of Epoxy Drying Machines in India with first machine dated back at 2nd April, 2010. Our machines are equipped with in-house automation, rigid structure and high quality electronic equipments. Resin Marvels provide good surface finish in minimum possible area by using space vertically instead of horizontally. 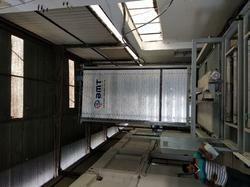 It is a 40 tray machine is best in case of single epoxy coating and production upto 2,50,000 sq. feet. Resin Ultimate provide good surface finish and can be customized as per user requirement. Its main purpose is to provide solution for fragile material which require filling and 2-3 coatings of epoxy resin. It comes under two variants with 70 tray and 90 tray. 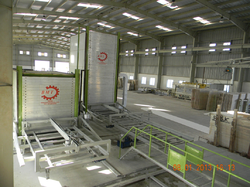 Selection of machine is done on the basis of process and production rate required. Maximum slab size 3450 x 2150 MM. chamber. All chamber heated at different temperature by separate heating circuit. No. of tray store in Drying 20 Nos. No. of tray store in Polymerization 45 Nos. Total Power Required 230 KW. Epoxy and Resin Application Manually. Total Resin Station 2 Nos. Lateral Shift Trolley 2 Nos. Unloading/loading Tilting Trolley 1 Nos.